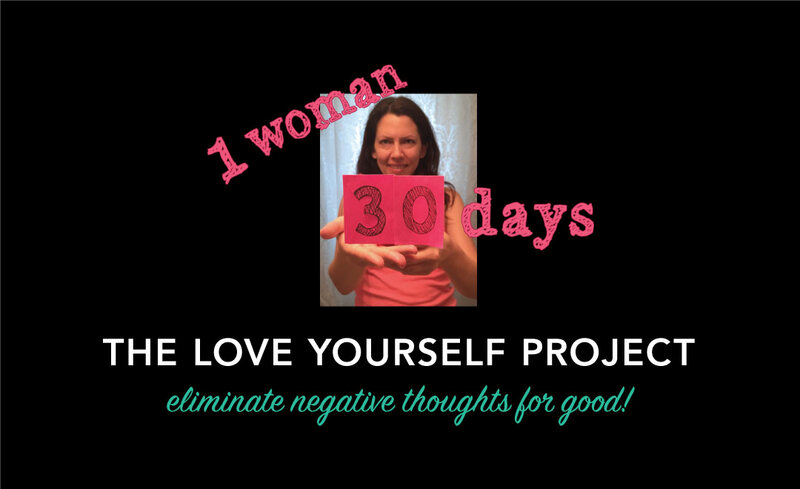 Watch The Love Yourself Project, a 30 day video experiment to dispel negative inner dialog and flip the switch to positively charged thoughts. It has been nearly a year already, people! A whole year has whizzed past since I spent 30 days shooting The Love Yourself Project from the comforts (and privacy?) of my own washroom. At the dawn of the last year of my thirties, I wanted to do something nice for myself, something long-lasting, meaningful, transformative, and challenging. So of course the logical choice was to do a kind of video journal so you can all watch too! Uhhhhh… what was I thinking? Nonetheless, it worked and I accomplished exactly what I wished. Watch the videos, and consider trying it for yourself! To change negative habits and patterns of self-inflicted negativity into positive reinforcement. Become a cheerleader for yourself! Video yourself first thing in the morning, right after you get out of bed–no makeup selfies will have nothing on you now! You should do it when you’re the most vulnerable and dishing out the worst negative self talk (for me it was the morning, it might be another time of the day for you). Through acknowledgement, discussion, and a pinch of embarrassment (re: recording yourself), you can dispel harmful negativity and replace it with positive inner dialog. The aim is to become your biggest cheerleader instead of wasting time limiting your beliefs. Dare to say at least one nice thing to yourself every morning while you look in the mirror. Address the negative chatter banging around in your head. Stop negative thoughts in their tracks. It takes will power but you can do it! Knowing is half the battle–for real. Research about body image, beauty, setting goals, training for extreme sports, psychology, and other interesting social experiments. Anything about women, beauty standards, or habit breaking goes! Look outward and start paying attention to how other people speak about, or address, women’s bodies; including the women themselves. 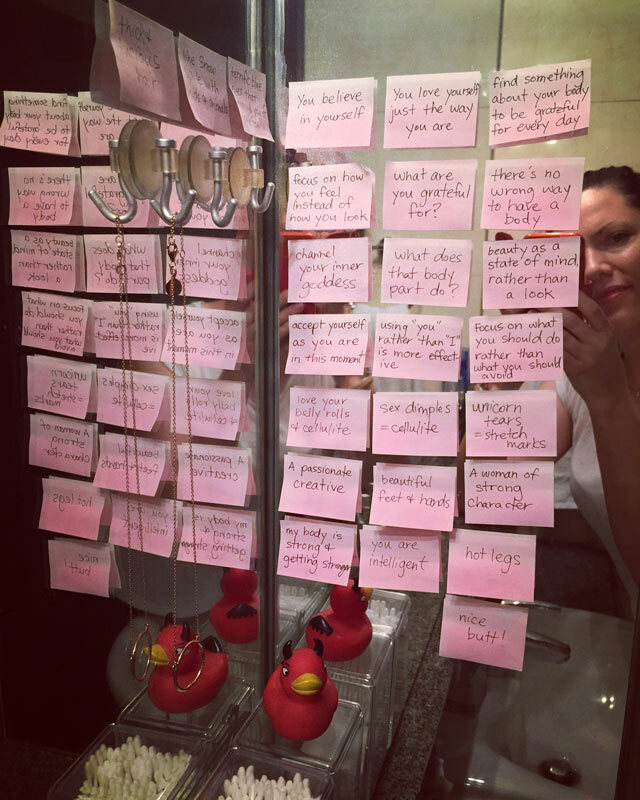 Develop a method for overcoming negative thoughts including using special motivational and/or positive phrases, sticky notes on the bathroom mirror, and being mindful of yourself throughout the day. Enlist the help of your friends and family. They are handy for helping you keep on track plus they behold a wealth of titillating conversation on the matter of body positivity and the pressures of society. The washroom. It’s where we look at ourselves in the mirror and see ourselves naked on a regular basis. My wall of happy thoughts to keep me on track. Now a little faded from being up all year! If you enjoy these clips from the project and wish to see more, you can watch all 30 days of The Love Yourself Project for free on my YouTube channel: Bridget Steis. Or you can head here for all the videos in order. On my big birthday next week, I plan to do one more anniversary video so stay tuned!!! !